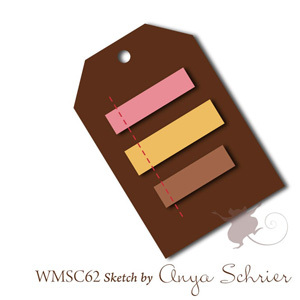 The Waltzingmouse sketch challenge this week is a tag. Slowly but, surely getting back into a little stamping in between our renovations at my house. Hardwoods done- painters coming this weekend to do the "cathedral" ceiling areas that would be a little difficult for DH and I. Working on granite kitchen countertops, new light in the foyer, a little fixer upper construction, etc. etc. -- basically by the time my DD's wedding the first of November- we will be done (including major cleaning and re-organizing). I'll be a happy camper when it's over but, it really is a lot of work!! 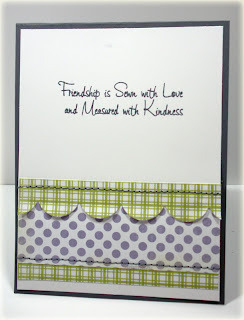 Cut out the tags with MFT's tag die and then cut the Crate Paper Emma's Shoppe dp with the same die. 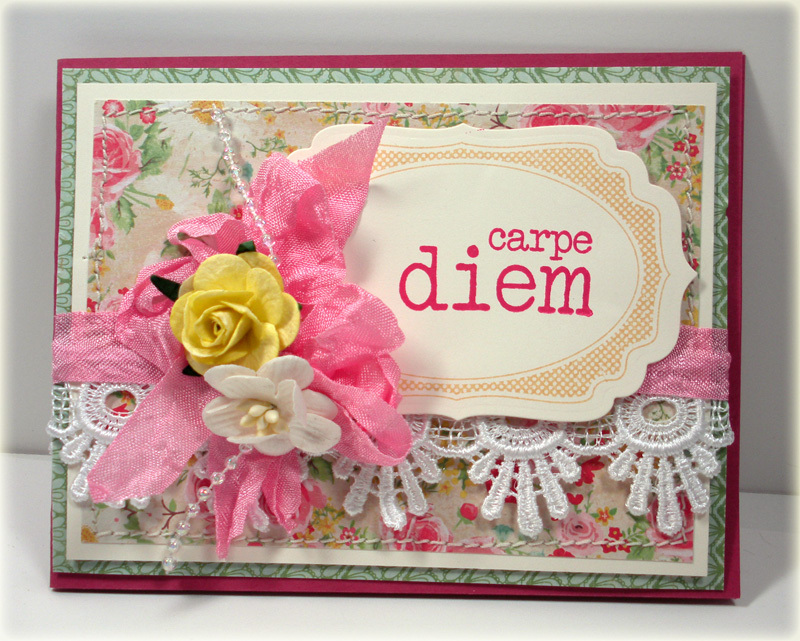 Added lace from Wild Orchid krafts and crinkled ribbon from Etsy. 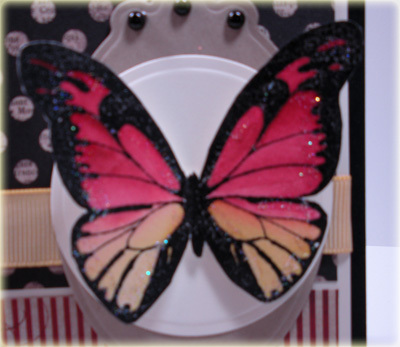 A Websters Pages bloomer with a sunburst bling from Pizzazzaplenty. 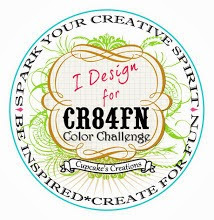 Sentiment flag was made using Waltzingmouse Stamps Bitty Banners and Fancy Phrases sets. Hope your hump day is going good!! Thanks for stopping by and appreciate your sweet comments!! 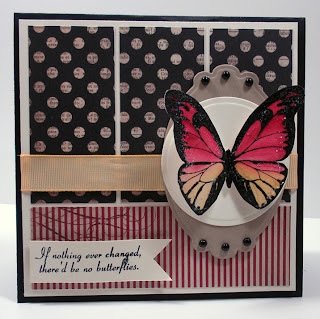 Made this card in one of my free moments this weekend (cleaning and painting after the hardwoods were put in). 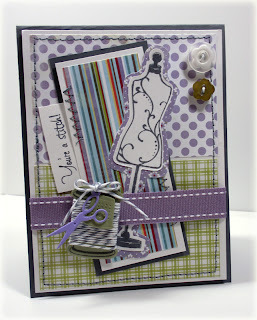 Used My Favorite Things Sew Nifty (stamps and die-namics set) that I received a while back and hadn't had a chance to get inky. 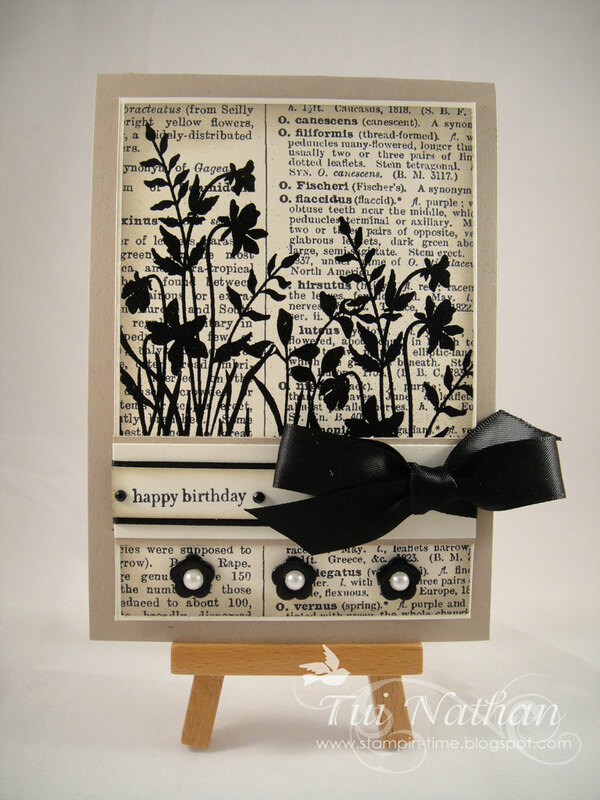 Paper is Lilly Bee Picket Fence. Pics aren't the greatest, sorry!! Rainy here last night and lamps didn't help much. Have a wonderful Tuesday and thanks for stopping by. Carpe Diem. CASE study celebration month and this week is to CASE yourself. 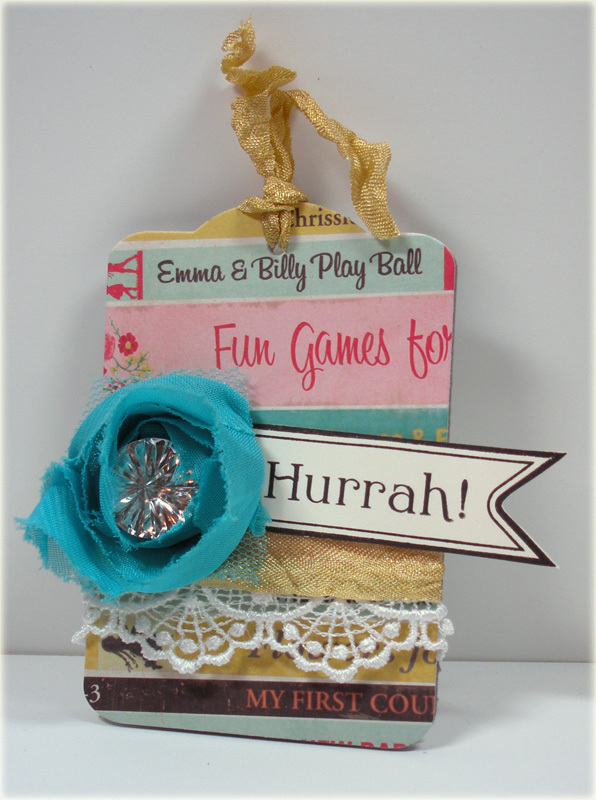 I made a card using some of my fav elements... lace, crinkled ribbon, pearls, a little stitching, flowers, and nesties with WMS outline image. 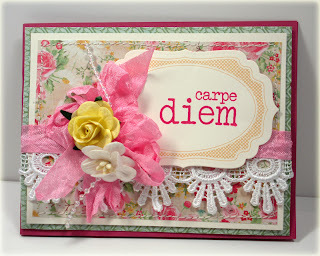 NEW Verve "Carpe Diem" from "Words of Wisdom" and dp is Crate Paper Emma's Shoppe!! Have been living in a hotel for the past week.. not, that's a lot of fun on vaca... but, mine was for the new hardwoods!! It was worth it, gorgeous floors... John did a fabulous job!! Home friday, lots of sawdust cleaning to do and painting the dining room... washing dishes, etc. etc.....great opportunity!! Off tomorrow, more cleaning and restocking the pantry!! Was thrilled to get in a card or two!! Hope you had a great weekend... hope my friends on the East Coast are doing okay with Irene!! 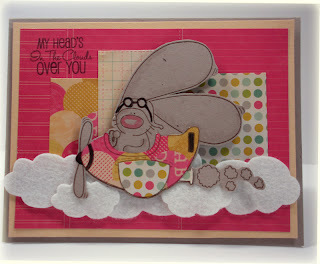 My head's in the clouds over you, that is!! Over this adorable bunny!! One of the stamps in The Cats Pajamas latest release... this bunny is sweeeet!! When the release came out... 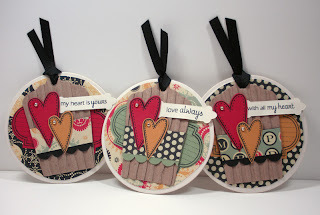 I was in the "counting pennies" mode due to the upcoming wedding and my blogging friend Kimberly offered to stamp some images and send to me (sweet, sweet girl) but, I finally broke down and bought a couple!! 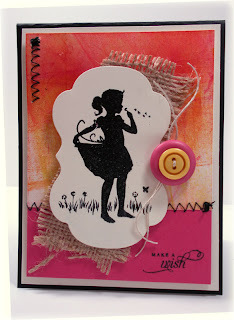 I made this card a little bit ago for TCP's weekly challenge but, hadn't had a chance to take pics. 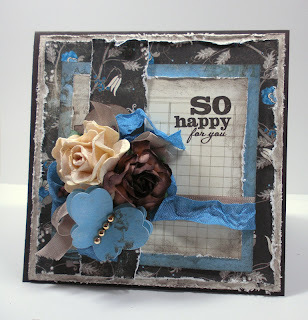 You need to check out the stamps and weekly challenges either on their blog or in the SCS forum. See, I told you that bunny is adorable!! Stamped the image with early espresso onto crumbcake and colored a little with copics. 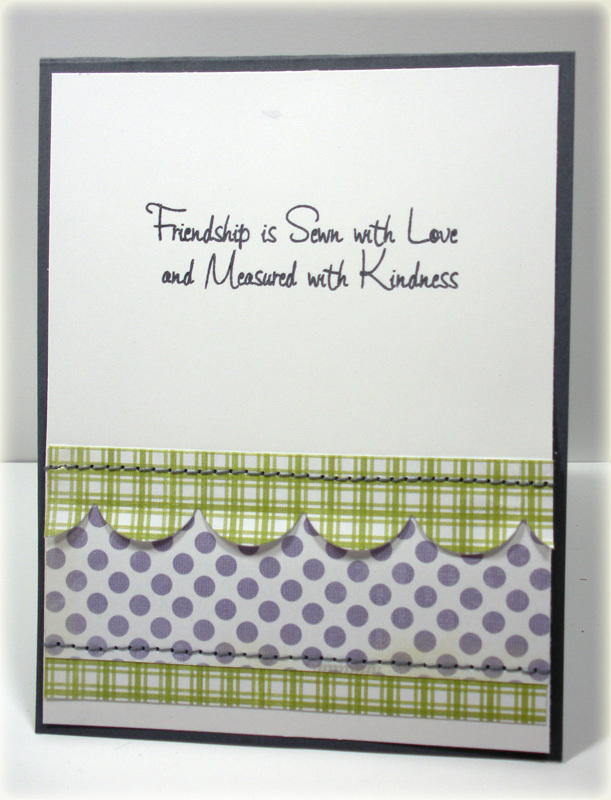 Used some CC Upcycle dp and paper pieced the plane. ﻿Added some clouds. TFL!! Have a wonderful weekend. I'll be packing up and on my way to an extended stay hotel (with DH, DD, and two westies)... sounds like fun, huh!! Having hardwoods put in and can't be here. Close enough to come by and check on things but, a little limited on cooking, access to upstairs etc. I know they'll be gorgeous and I'm excited (took 2 years to convince DH) -just not looking forward to the no access to stamp space!! You KWIM!! If you stop by, I appreciate all the sweet words!! Tui's... how gorgeous is this!!!! 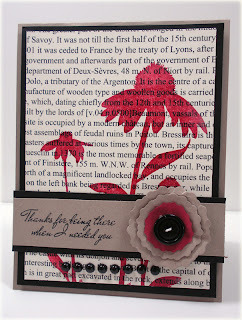 Love the silhouette stamped on text and layout. 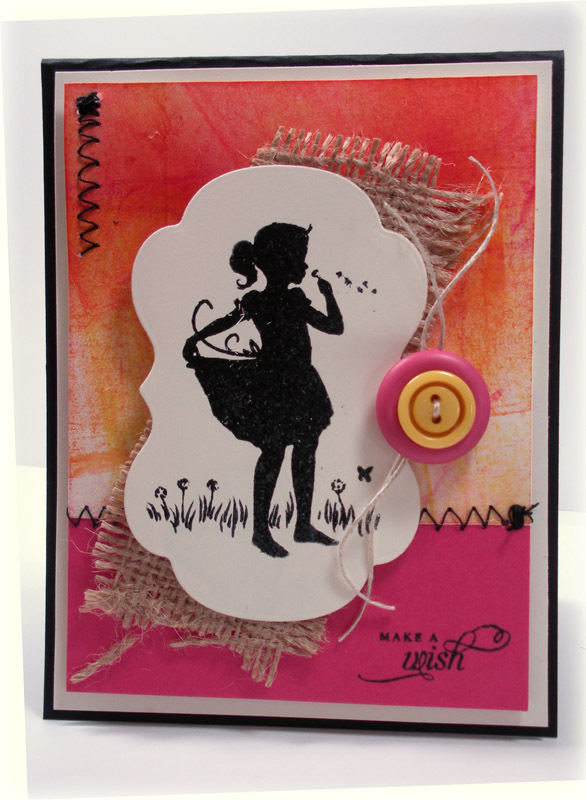 I kept the silhouette image but, stamped in SU Riding Hood Red and embossed with clear onto a text bg (digital download from MFT). Changed up the ribbon to Verve's Floral Circle dies with a button in the middle (thinking Monkey in the middle... yes, I've been out celebrating kids growing up and getting a little nostalgic... and wanting to "stir up a little trouble, or was that fun??) Bottom with black pearls. 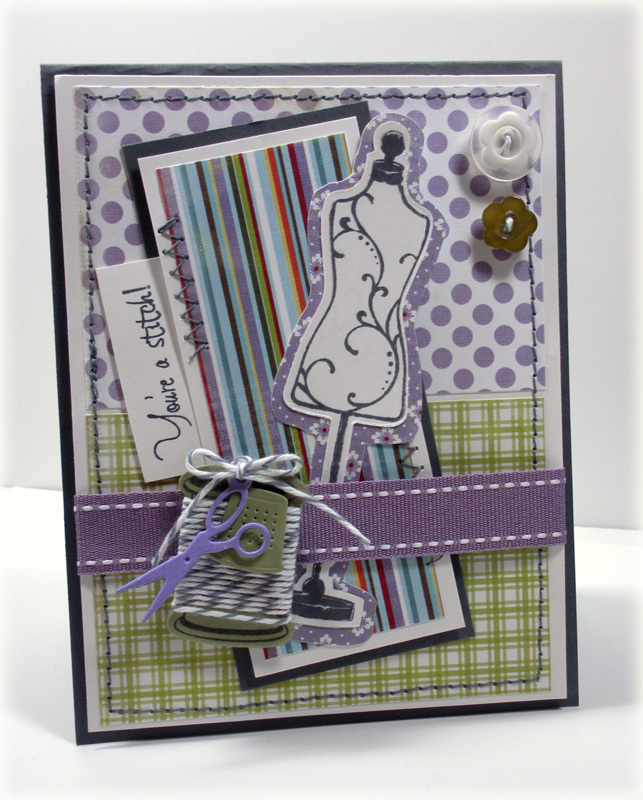 Have you ever made a card and the conception didn't always meet the execution.... now, I know you have!! 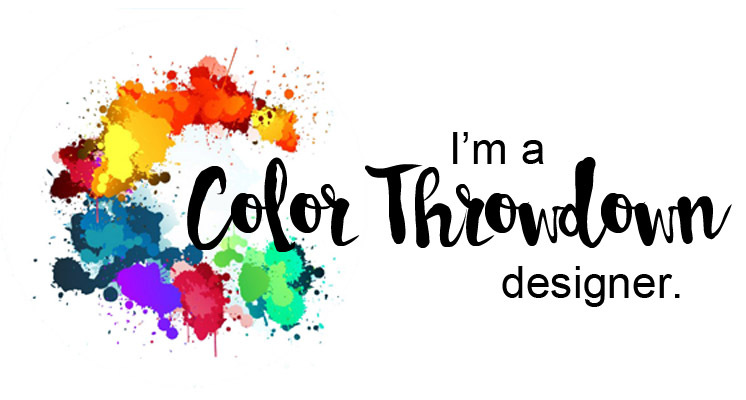 Only 'cause I would think that most "arteests" (well, I think we are artists in our way anywho) who make cards think about it and piddle with thoughts, layouts, colors etc.!! 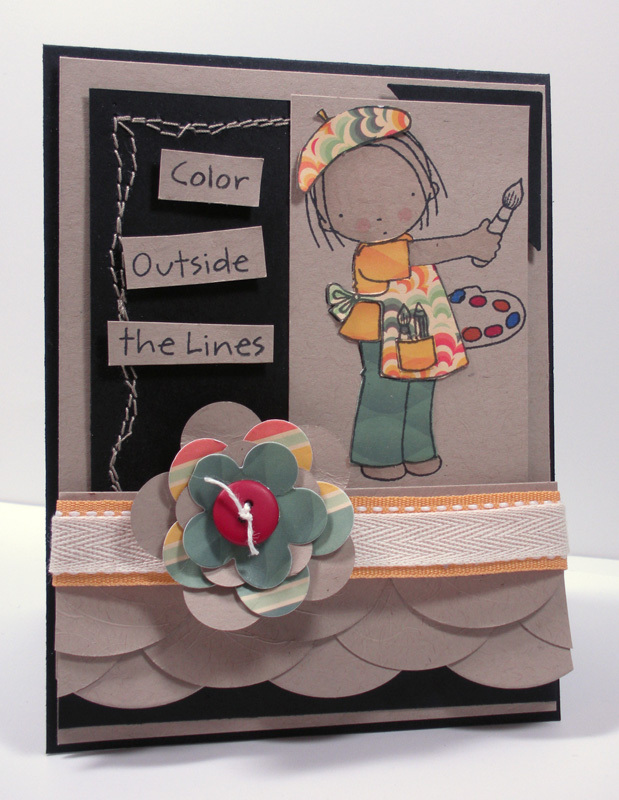 Made this card for the MFT weekly sketch challenge on SCS... wanting to use neutrals with "pops" of color. Couldn't add the sketch pic... western european and PC won't take.... or it's OE (probably)!! I did take a little liberty with the sketch, LOL!! Have a wonderful week. Tomorrow is my oldest DD's birthday and my anniversary!! Going out for Japanese hibachi grill... bound to have a little fun!! Thanks for stopping by and appreciate all the sweet comments!! 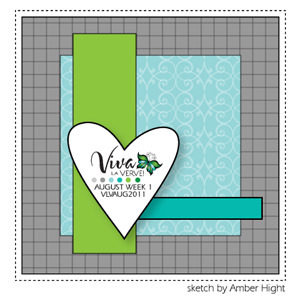 This month Jackie is hosting the Verve Get Your Diva On Challenge and "tags it is"!! Suprised, you shouldn't be as Jackie Pedro is the queen of tags... that girl can crank out some gorgeous ones!! 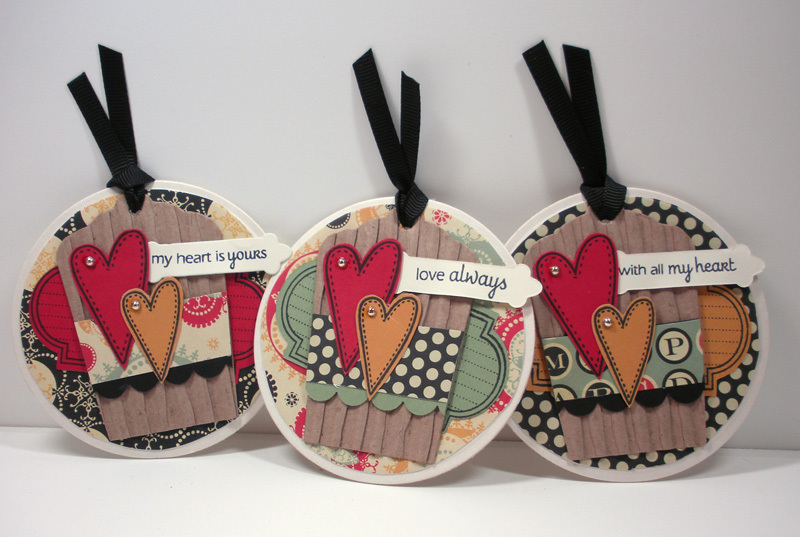 I have only made tags a couple of times, not sure why as I did have making these. These little things were giving me a tough time photographing and the rainy weather didn't help much either. 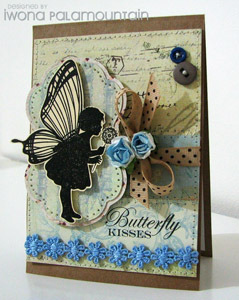 Used lots of Verve's dies and stamps. 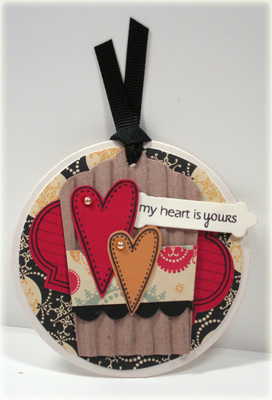 The circle backing was cut out of thin chipboard with a circle nestie and a layer of dp was placed on top. 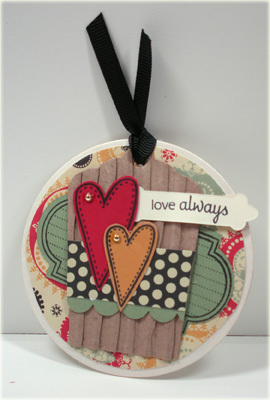 Cut three Classy Oval dies (Verve- A Cut Above Dies) and stamped with an image from Love Notes. 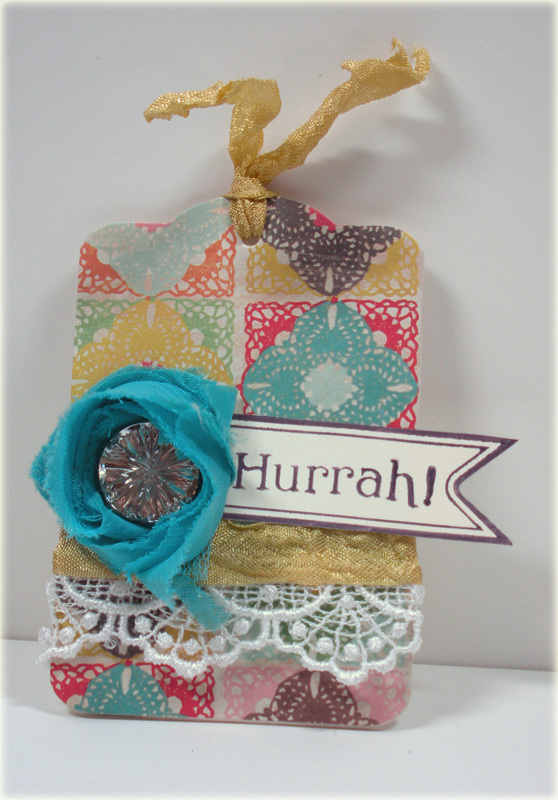 Added some Sweet scallop tags die cut in crimped kraft cardboard (purchased from the funkiejunkie on Etsy- thin, wonderful stuff!!) Added a border with dp and scallops on the tags. 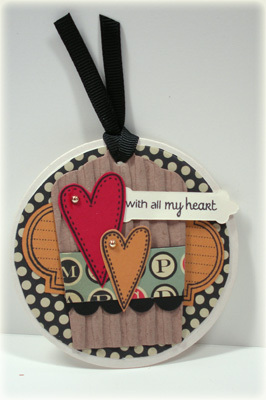 Some hearts from Verve's Text objects with gold pearls from Pizzazzaplenty. 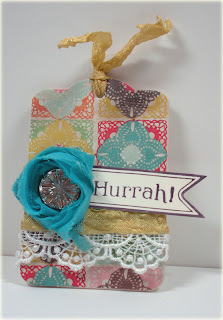 Finished off with a sentiment from Verve's Small phrases stamped on a banner made with Verve's Charming Banner die. Hope you're having a wonderful Sunday. Mine's pretty good although, I'm getting this posted as the Urgent Care isn't open yet... my youngest (18), I believe, has strep. This is the second time this year... yikes, she had it a lot as a child, hope we aren't looking at a tonsillectomy?? Guess I'm "titled" out. Busy week. Made this card a couple days ago and just now had time to take pics and post. 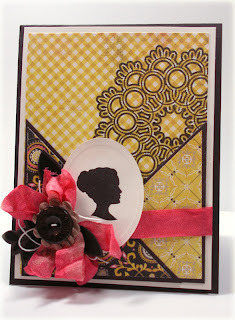 Used some fav Waltzingmouse stamps- Cameo Maker and Large Doily. 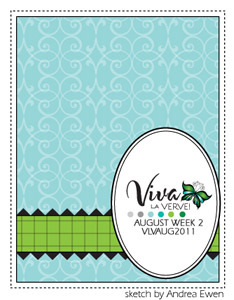 Used new Authentique papers that I'm favoring right now, too. Stamped one of the doily images in early espresso onto the patterned paper, added a cameo in early espresso to an oval nestie and popped in the corner. 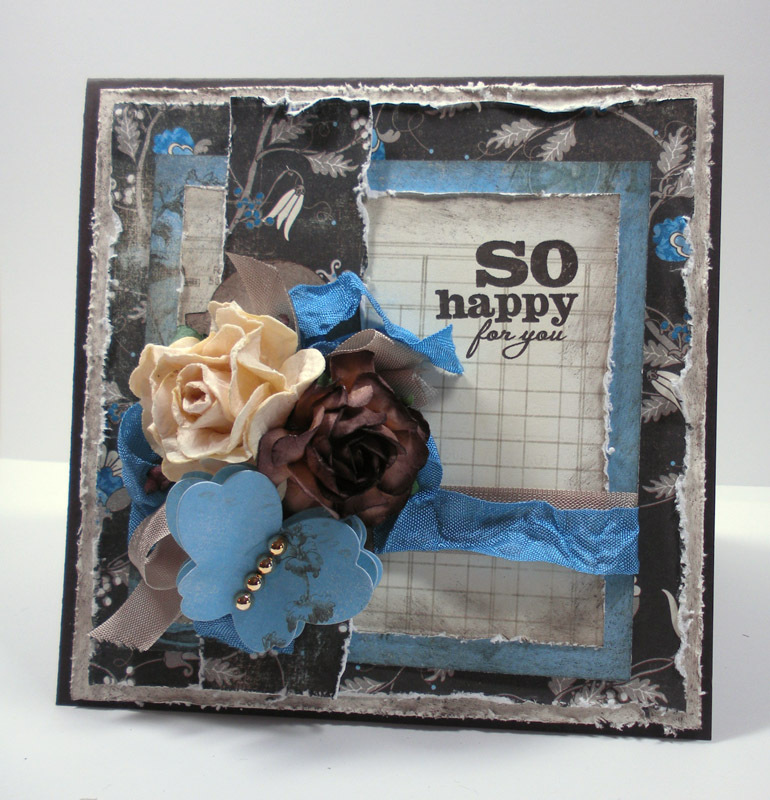 Some ribbon, linen thread, Jillibean soup corrugated flower, and leaves stamped and cut with a Verve die for an embellie combo. Thanks for stopping by, appreciate your kind words!! Have a great weekend!! Pulled out the image and inked with memento tuxedo black and clear embossed and just "got to playing"!! Now, I WAS thinking about Chupa when I made it. I was adding and arranging the card... totally in my little zone.. and then, I was done, looked at the card I chose, versus, the one I made, and thought, "You're way off here"!! So... here were my random thoughts/acts of CASEing Chupa: use of bright colors (check, she does that), buttons (check), burlap (check), and stitching (check). 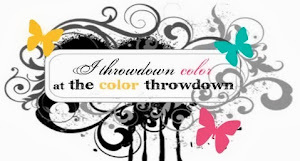 Now, today Chupa posted a card and made a comment that normally she uses bright colors.... see, that's proof I was thinking about her when I made it!! This is also for the Flourishes Shades of Sunset challenge to make and/or use sunset colors in a card. The sky was done with pumpkin pie, daffodil delight, rose red, and cameo coral. First time I tried blending colors like that and I'm definitely not a Michelle Zindorf!! My week's definitely turning into a busy and "enlightening" one!! Sometimes, one does ones' job so well, they get volunteered, KWIM!! Thanks for stopping by, leave a comment if you do. Appreciate all the kind words. there'd be no Butterflies!! Sad world indeed without butterflies!! Posting in a hurry- storm on it's way (not sure if its' major but, last Friday we had major probs with flooding- pic of a guy in parking lot at his business with water to his waist --if he was "short" the paper took some liberties to be dramatic!! Although, my dad in Indiana asked about the rain- watching the news and keeping up with his "southern family"--- LOVE that man!! To business... starting to get back in the swing of things and this card is for the My Favorite Things Weekly Sketch challenge on SCS here. 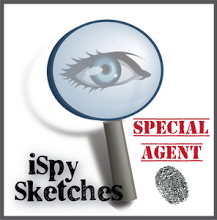 Sketch is from Frances. 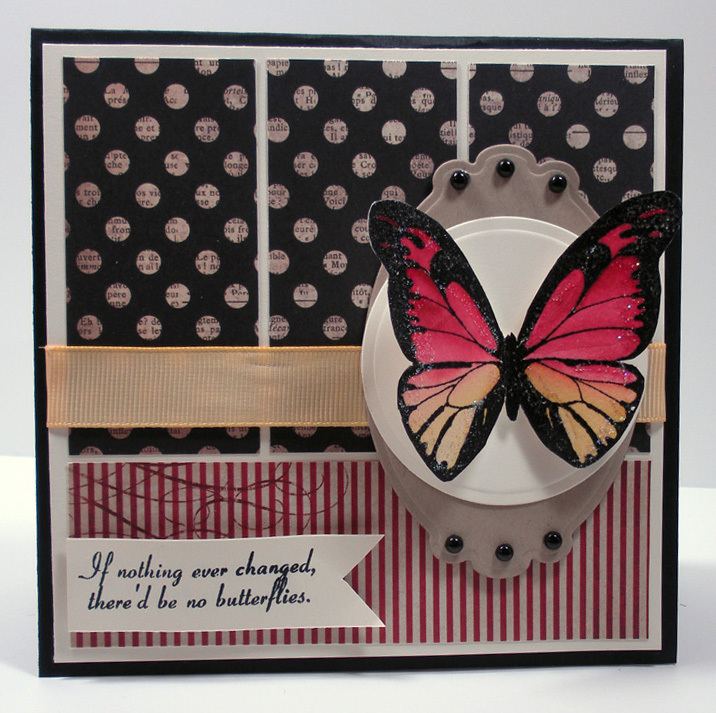 Have had the "Inspired by Butterflies" set for a little bit and hadn't inked yet. TFL and stopping by!! Hope your week is off to a good start. 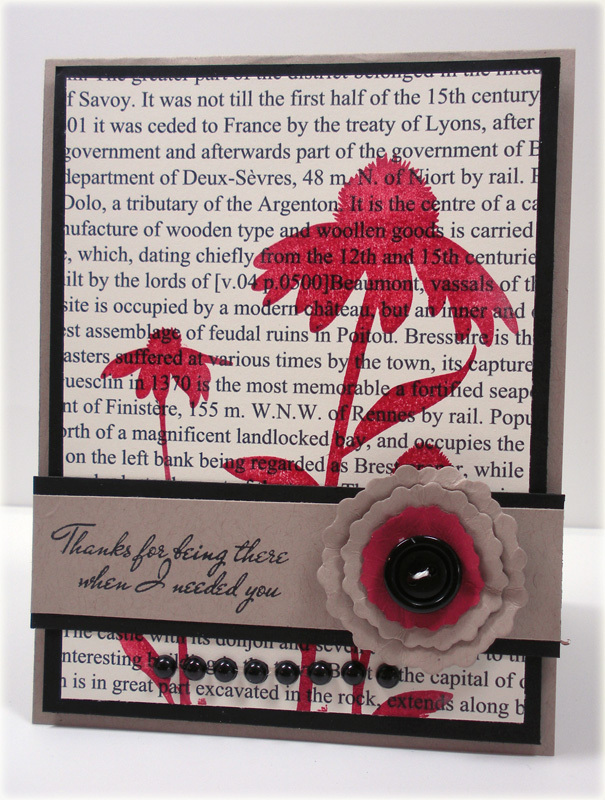 Love the new Authentique line of papers... this card uses Uncommon. 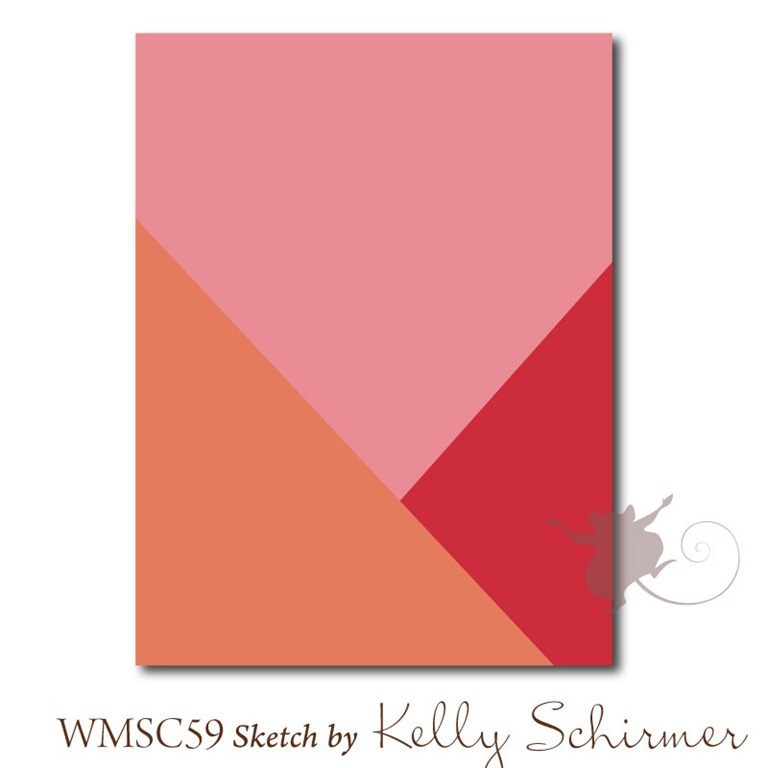 Lots of pinks and grays and blacks! Card is for Verve's weekly sketch challenges on SCS. Andrea's sketch for week 2. Used Verve's Charming Oval Die with a sentiment from Verve's Small Phrases (sentiments in this set fit Verve's Charming Oval and Charming Banner Dies perfectly... gotta love that!!) 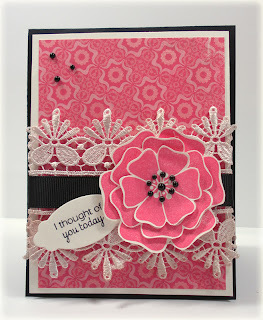 Added flowers from Verve's Great Friends, some Wild Orchid Crafts lace that I tea-dyed, and a few black pearls. Hope you're having a Great Sunday eve... I've been cutting, embossing, adhesving, and scoring!! My oldest is getting married and we are making the invites.... phew... definite production line going on, LOL!! or is that FOR ME!! Finally had a chance to stamp a little (last weekend was full with wedding preparation and more to do this weekend, so I snuck in a Friday night... go ME!!). 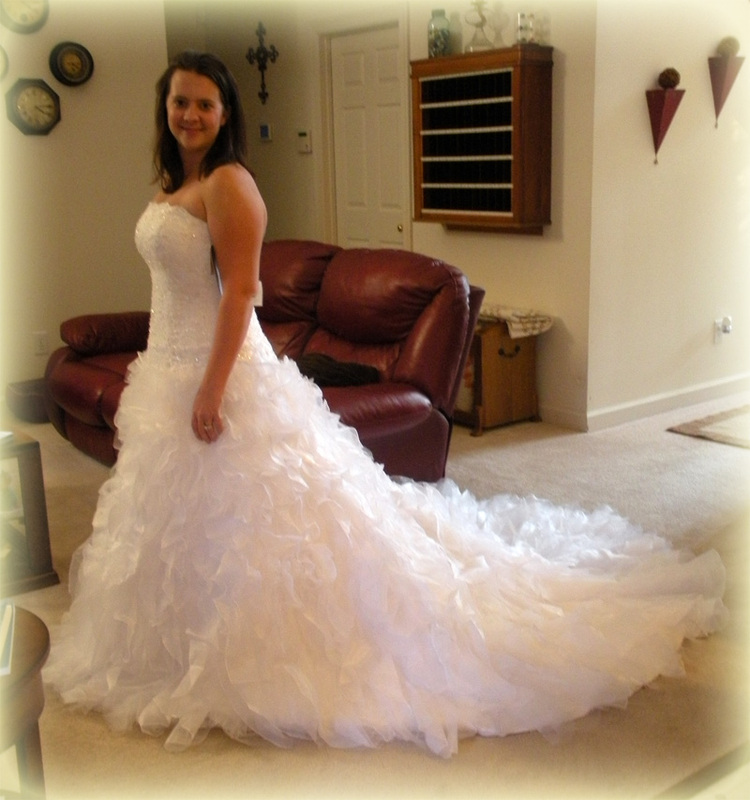 Last Saturday was the date to pick out/order flower girls and junior bridesmaid dresses/shoes/hair flowers. My daughter is marrying an "older" man and his youngest, Maddie-7th grade next year, and the little ones needed to get their "ensembles" for the wedding. The little ones are 3 and 6 with blond Shirley Temple hair (lots of curls for those of you who don't know who Shirley is!!). The 6 year old was feeling like a princess and the youngest was getting bored. Absolutely adorable!! Maddie (14) will be in heels- the 3 1/2" ones!! I'm thinking she needs to practice a little!! Lauren, the bride, found hers- a pair of 4" Vera Wang stilettos!! Not me- I'm wearing flats 'cause by that night I'm dancing a little- I definitely will deserve it by then, LOL!! Now... is that girl "frou frou" or what??? Get tickled... I was not "puffy" when I got married. She is sooooooo excited and everyone keeps saying I'm going to cry and I keep saying, I think I'll be okay but, honestly---I think there are tears in the forecast!! Hope you are having a wonderful Saturday. My "bride" is coming over and we're looking into hotels today, phew.... getting married is a little project!! Love when you stop by and appreciate all the kind words! !